This quilt is a long time in the making! 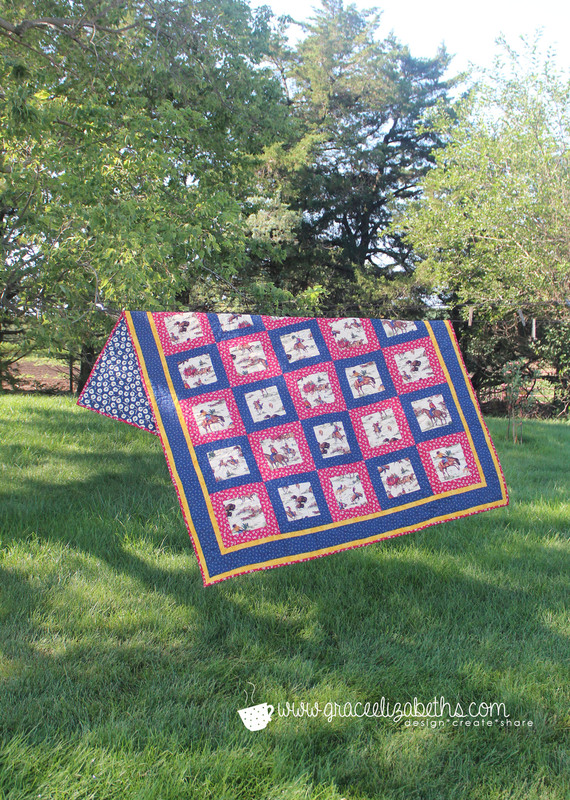 I started making this quilt in my college dorm room for Jake (before he was my husband!) That was at least 5 years ago! It was intended to be a Christmas present – then a birthday present – turned a graduation present. And now that it’s finished I figured he’s waited for it long enough – no special occasion needed to give it to him. My husband, he is a cowboy! When I saw this fabric in a quilt shop I knew I needed to make something for him with it. Also is the quilt shop was a baby quilt that had fussy cut blocks. I loved the look and thought it would be a great way to highlight the fabric. Right there in the fabric shop I designed the quilt and figured yardage with the help of the shop owner. I got started right away fussy cutting and cutting strips and whipping up blocks. The quilt came together really fast. I got 3/4 of the way done before the quilt got packed away – deep! It resurfaced a year and a half later I dug it out and assembled the blocks together. However, I didn’t finish the quilt top before it went back into storage. Last spring I added the borders and quilted it over the summer. 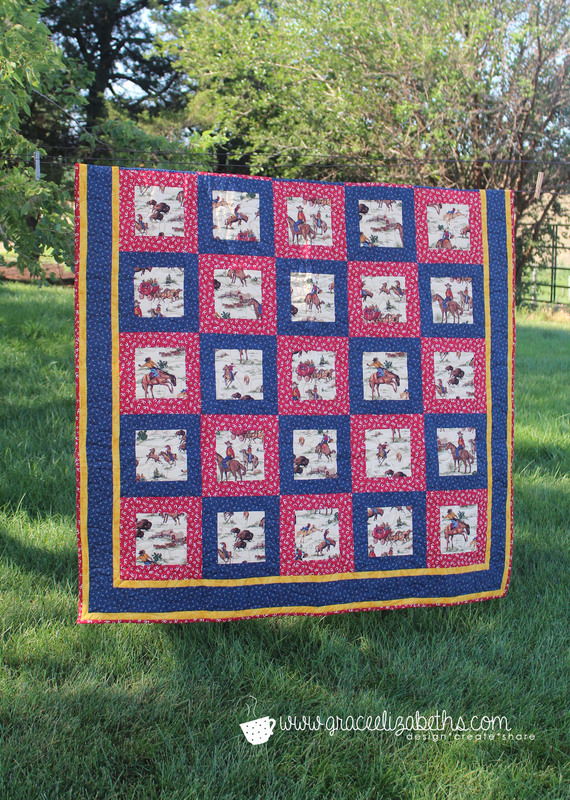 I love the quilting – as I think it resembles stitching on cowboy boots. 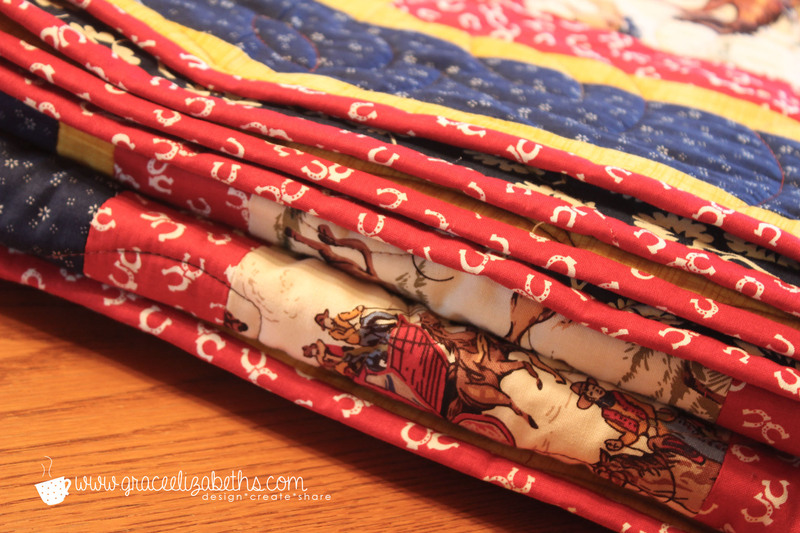 This summer the binding finally finished the quilt! Hallelujah! And now my cowboy can finally enjoy his quilt while we are separated for vet school. The Sew Happy Printable is no longer available for free, but rather can be purchased for download in the Grace Elizabeth’s Etsy Shop. A good sewing machine makes a world of difference in attempting a project. I purchases my Janome DC5100 as a college graduation gift for myself about three years ago 🙂 Others of you may be using an older model – When I first started teaching FACS, the models in my room were over 30 years old – iron workhorses! No matter, we love our sewing machines. My sewing machine and the things it allows me to create makes me happy. I hope this printable that I have created makes you happy too! It would be a great addition to your craft room. Sized for an 8×10. Enjoy! NOTE: Grace Elizabeth’s watermark does not print on the purchased download. What model is your sewing machine? How long have you had it? Since the whole gang was together for Easter, I decided to document the gathering in my Project Life book. Lately whenever we’ve all been together to make sure to grab some family snapshots and candids. I also jotted a few things down to include in the journaling including the dinner menu and fun games we played. The weather was beautiful and we played bocce ball for hours! In my layout I used template A and the spring theme kit. It was a quick, cute digital scrapping endeavor! How did your family celebrate Easter? 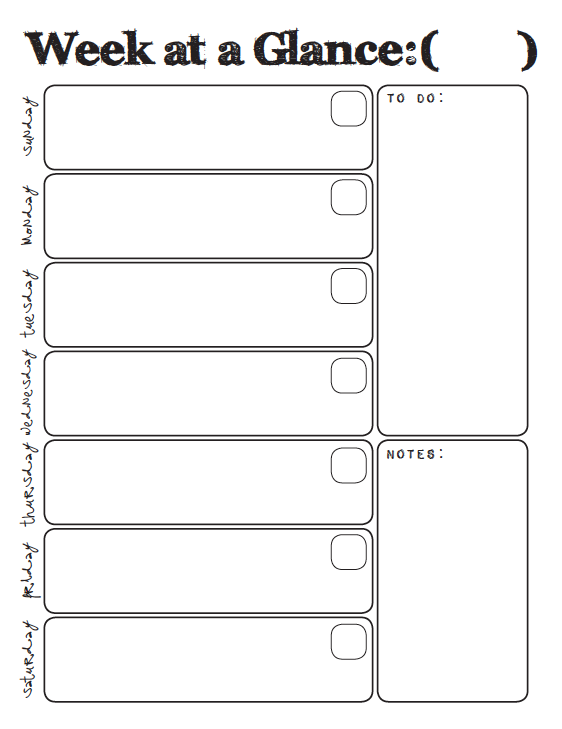 What your latest Project Life page?